For almost fifty years, since the cineaste-filmmakers of the French New Wave first heralded him, the films of Frank Tashlin have been viewed through a single lens. As one of the two studio-era Hollywood directors to make the jump from animation to live-action (Gregory La Cava is the other), Tashlin has long been seen as a director whose cartoons somehow resemble features, and whose features are somehow “cartoony” (1). Though his work comes up for minor re-evaluation every twenty years or so, the critical approach to Tashlin’s work has been remarkably consistent. It is as if this one fact about this career is the only one that matters; the “hook” seems to be too good to resist. While it is certainly unusual and extremely interesting that Tashlin emerged from print cartooning and animation to make live-action features, it is not an all-purpose explanatory mechanism. In fact, his career has been oversimplified and misunderstood due largely to the ahistorical approach that most scholars have taken in discussing his work. Ahistorical, that is, in the sense that no one has yet situated Tashlin in any of the contexts which would allow us to better understand his style, and to move away from this monolithic approach. For Tashlin is unusual in another way: unlike most of the other mid-century Hollywood directors who are generally granted auteur status, Tashlin worked in but one genre: comedy. His peers, such as Robert Aldrich, Richard Brooks, Nicholas Ray, Douglas Sirk, Howard Hawks, Billy Wilder and many others, hopped from genre to genre; indeed, this is one of the reasons they are generally considered auteurs: the ability to maintain stylistic and thematic consistency no matter the genre in which they worked. Throughout his long career (his first animated film was made in 1933 and his last feature was made in 1968), Tashlin never made a picture that couldn’t be slotted firmly into the genre of comedy. (Say One for Me , probably Tashlin’s worst film, is something of an exception, for this and other reasons.) My suggestion, then, is that we look at Tashlin not through the lens of how feature-like his cartoons are, or how cartoony his features are, but with an eye toward American comic traditions. How, then, do we discuss Tashlin? Generally speaking, several things make his work stand out. Few directors were as adept at adjusting their styles to accommodate the stars with whom they worked. Tashlin arranged the elements in his frame to accommodate the improvisatory skills of a comedian like Bob Hope (in The Lemon Drop Kid , Son of Paleface  and The Private Navy of Sgt. O’Farrell ) or Danny Kaye (The Man from the Diners’ Club ); and not even Jerry Lewis knew better than Tashlin how to direct Jerry Lewis. Fewer still possessed Tashlin’s skill with mise-en-scène. The bold colours in many of Tashlin’s features are not so much a link to animation or comic books, as many critics have argued (if that’s true, then the films of Douglas Sirk, Stanley Donen and even Budd Boetticher are equally cartoony), but should instead be considered one facet of Tashlin’s mise-en-scène arsenal. 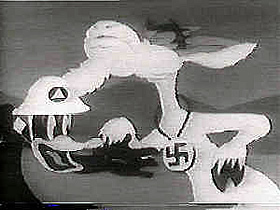 Tashlin’s films took full advantage of the CinemaScope frame, whether by having Tom Ewell magically “push” the frame edges out in the pre-credits sequence of The Girl Can’t Help It (1956), or by filling it with absurdly elongated objects like tiny Jessica the dachshund dragging an enormous dinosaur bone along the beach in Bachelor Flat (1962). Regarding his sense of humour, Tashlin’s jokes tended more toward the ribald than to the “sophisticated”; there is a way in which he is more closely related to Russ Meyer than to Billy Wilder (though Wilder, as proven by Kiss Me, Stupid  and other films, certainly had a naughty streak). Sexual humour can be found throughout Tashlin’s oeuvre, and he was constantly in battle with the Production Code Administration. Tashlin tapped into deeply American comic roots by filling his films with heaving bosoms, double entendres and thinly veiled commentary about sexual activities (2). As vaudeville, the Borscht Belt circuit (from which Jerry Lewis emerged) and early American screen comedy were jam-packed with risqué humour, it would be historically inaccurate to say that Tashlin introduced a particularly naughty streak to Hollywood, but his style is built in some ways in ribald humour, and for this reason he stands out. Then there is the issue of the transition from animation to live-action, a topic which is far from irrelevant, but whose importance has surely been overstated. Though, as discussed below, the explanations for the connections between these two “realms” of filmmaking are quite consistently fuzzy, Tashlin is still by far the most prolific and successful former animator to become a director of live-action features in Hollywood: if we know anything about Tashlin, it is this. So why don’t we know more about him? Born in 1913, in Weehawken, New Jersey, young Tashlin found a job at the Fleischer Animation Studios in New York as an errand boy and cel-washer (3). This led to a job at Van Beuren, the nearly forgotten animation studio responsible for such series as Aesop’s Fables and the original Tom and Jerry, which had nothing to do with cats or mice. In April 1933, Tashlin met Leon Schlesinger, producer of Warner Brothers’ “Looney Tunes” and “Merrie Melodies” cartoons. He accepted the job that Schlesinger offered and moved to Los Angeles to join the other young, innovative animators at the fabled “Termite Terrace” building. There, his colleagues included Robert Clampett, Chuck Jones and Tex Avery, the man who, most animation historians agree, established the “anything goes” sense of humour that became Warners’ trademark. Avery was a major influence on Tashlin. 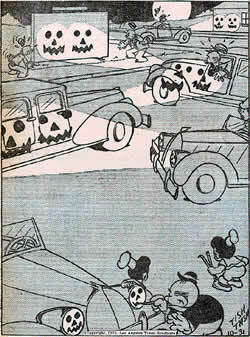 Tashlin wrote and drew a daily comic strip, “Van Boring”, which ran in the Los Angeles Times from 1934 through 1936. It was successful enough to prompt Schlesinger to ask for a cut of the profits. Tashlin wrote of the situation, “He wanted a cut of it, and I said go to hell. So he fired me” (4). After some time as a “gagman” at Hal Roach Studios, where he supplied material for Laurel and Hardy and The Little Rascals, Tashlin returned to Warners, where he was given the task of developing the character who would become the first true “star” in the Merrie Melodies stable, Porky Pig. From 1936 to 1938, Tashlin directed 21 cartoons at Warners, 13 of which featured Porky. Just nine years into his career in filmmaking, Tashlin had worked in print cartooning, animation and live-action film. Moreover, he had already come into contact with many major comic figures of all stripes: the Fleischers, Tex Avery, Chuck Jones, Robert Clampett, Friz Freleng, Laurel and Hardy and The Little Rascals. Early on, then, he was steeped in popular comic traditions. Though their precise influence is difficult to ascertain, Tashlin was a young, talented artist smack in the middle of the comedy industry: something surely rubbed off on him. Like many talented animators at the time, the peripatetic Tashlin soon found his way to Disney, and worked there between 1939 and 1941, though he never once received a screen credit. He left to accept a plum job as the head of the story department at Columbia Pictures’ new animation division, Screen Gems. His work there is regarded as the best ever produced by that studio; one film in particular, The Fox and the Grapes (1941), is often cited as especially innovative. It has a classic “blackout gag” structure: the fox repeatedly tries a variety of increasingly baroque methods to steal the grapes, failing every time. Chuck Jones often cited this film as the inspiration for his “Road Runner and Coyote” series, though the blackout-gag format is a remnant from variety shows, vaudeville and other, earlier, forms of episodic theatrical entertainment. Vaudevillians who specialised in sketch comedy, for instance, depended on this structure. Whether he did it consciously or not, Tashlin, with The Fox and the Grapes, was tapping into deep comic roots. In June 1942 Tashlin returned to Warners for what would be his last term. This time around, Tashlin directed and/or oversaw fourteen cartoons, featuring Warners’ marquee characters: Bugs Bunny, Daffy Duck, Porky Pig and Elmer Fudd. Particular standouts are the Oscar-nominated The Swooner Crooner (1944), in which farmer Porky auditions a raft of celebrity-impersonating roosters to incite his hens to lay eggs, and Nasty Quacks (1945), which features Daffy Duck at his malevolent best. Tashlin also directed four of the fascinating “Private SNAFU” cartoons, which comprised the Schlesinger Studios’ contribution to the war effort. These films were made expressly for the armed forces and, as such, contained humour slightly more risqué than was to be found in the theatrical releases. Tashlin’s taste for the language of feature films was evident from the very beginning in his first stint as an animation director at Warners in 1936. Tashlin’s first Warners cartoon, Porky’s Poultry Plant (1936), contains delirious high and low angled shots (and rapid-fire editing) of a daredevil aerial dogfight with a marauding buzzard. He employs elaborate montages of bugles blown and bayoneted rifles raised high in…Little Beau Porky (1936)…Little Pancho Vanilla (1938) utilizes simulated “camera movement” that was quite unusual for animated films of the period…Wholly Smoke (1938) opens with a fancy “tracking shot”…[and also] incorporates atmospheric “dissolves” that chronicle Porky’s mounting cigar sickness and tobacco-bred hallucinations (6). But the problem with arguments such as Ford’s is that animation is film, and animators have at their disposal all the tools of filmmaking, including, but not limited to, camera placement and editing (7). Unconventional camera angles and a rapid editing pace are not the exclusive domain of live-action cinema; even if Tashlin was among the earliest to explore more fully the options of these artistic parameters, it does not make him any more or less “cinematic” than other animators. How, then, should we look at Tashlin’s animation? Focusing, as Ford does, on the Warner Brothers work (probably the most varied and representative sample; the Columbia films are unfortunately very difficult to see), we can make some observations. First, Tashlin was working within the Warner Brothers “house style,” if such a thing can be said to exist. Tashlin’s films therefore resemble those of Clampett, Jones, Freleng and others in several ways. First, as mentioned above, the driving force behind Looney Tunes / Merrie Melodies’ humour was probably Tex Avery, whose “gags on top of gags on top of gags” philosophy was adopted by his colleagues, and Tashlin is no exception. His 1938 film Have You Got Any Castles?, for instance, sacrifices nearly all semblance of story in favour of a series of one-off gags built around the idea of book and magazine covers “coming to life”. So, for instance, the cover to The House of Seven Gables features seven Clark Gable caricatures jutting their heads from seven windows. This would be funny enough, but Tashlin takes it further by having each jug-eared Clark sing just a syllable or two of a song lyric. The effect is a bizarre and disjointed melody sung slightly off-key by a chorus of identical caricatures. Such a gag is particularly interesting for the fact that it is, at once, altogether typical of the Warner Brothers style of cartoon humour (rapid-paced, caricatural, topical, multilayered) as well as a clear link to the humour in Tashlin’s feature work. In this example, Tashlin crams the frame with gags, extracting as many laughs as he can from a simple set-up. Compare this to a scene from The Disorderly Orderly (1964), in which Jerome Littlefield (Jerry Lewis) and Julie Blair (Karen Sharpe) dine in an Italian restaurant. The scene begins with a through-the-jukebox shot of Lewis gazing in open-mouthed astonishment at the record-changing mechanism. Moments later a waiter arrives, offering the couple various foreign foods in a range of broad ethnic accents. A huge plate of steaming pasta arrives, improbably, within seconds and Jerry, in attempting to serve it, winds up with a coiled mitt of spaghetti wrapped around his hand. After the couple exchanges a few words, they leave the restaurant and step into the street, where they stand in front of a travel agency whose window advertises, as an example of TWA’s new in-flight movie service, The Disorderly Orderly. As far as devices such as camera placement, editing pace and sound, the two scenes have little in common. But in terms of comic strategy, they are closely related: both are short scenes with almost as much comedy packed into them as will fit, and they both refer to the filmmaking process in some way. 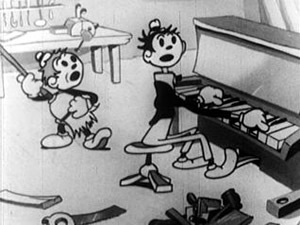 It is genuinely difficult to tease out Tashlin’s animation style from the Warner’s “house style.” All Termite Terrace animators used clean lines; bold, solid colours; topical references; caricature; and all made full use of Carl Stalling’s remarkable Raymond Scott-based scores. Tashlin’s films were no more “feature-like” than Freleng’s or Clampett’s. There are small differences, of course: Chuck Jones tended to use more abstract, pastel backgrounds than his colleagues; Freleng’s films were perhaps a little bit more quickly cut; Avery’s were (correctly) regarded as the Looniest Tunes of them all. How did Tashlin’s stand out? Possibly by dint of a sense of humour that was both slightly more bitter and slightly more absurdist than those of his colleagues. (One of the true landmarks of absurdist humour occurs in Tashlin’s small masterpiece, Plane Daffy , in which Daffy, pursued by the oiseau fatale Hatta Mari, jumps into a refrigerator to hide. Half a beat later, he pokes his head out and says, to no one in particular, “Well, whaddya know? The little light – it stays on!”) Finer-grade distinctions, in truth, have yet to be made: most work on Warner Brothers animation looks at the house style rather than at the individual directors. Anything we can learn about Tashlin’s animation must come from observing his work as it compares to that of his colleagues. Well schooled by this point in comedy, Tashlin moved in 1946 into the realm of live-action, writing gags for such stars as the Marx Brothers, Lucille Ball and Red Skelton. Also at this time, Tashlin’s first children’s book, which he wrote and illustrated himself, was published to largely favourable reviews. The February 16, 1946, issue of The Saturday Review of Literature even featured Tashlin and his bear on its cover, and the article inside is titled “From Comic Strip to Comic Art” (8). Previews held in late 1950 for the Bob Hope comedy The Lemon Drop Kid were unsuccessful, and Hope and producer Robert Welch offered Tashlin, one of the film’s screenwriters, his big break. Tashlin shot retakes and added new material to the film that amounted to almost exactly one-third of its running time. Hope and Welch were eager to work with Tashlin again, and offered him the job as writer/director of Son of Paleface. But Tashlin did not wish to sign a contract with any single studio, and so accepted the job of writing and directing The First Time at Columbia before Son of Paleface got off the ground. Now in demand as a writer and director of comedy, Tashlin would work steadily in Hollywood for another 16 years. At this same time, an earlier “chapter” of his life came to an end with the publication, in November 1951, of The World That Isn’t, the last of his three children’s books to find its way to bookstores. (The Possum Who Didn’t was published in 1950.) All of Tashlin’s children’s books are somewhat cynical about the state of the modern world, but The World That Isn’t is particularly bleak. This world is peopled by thoughtless, irresponsible, superstitious, gluttonous, foolhardy, selfish, two-faced philistines with no concern whatsoever for their fellow man. Done in by their own stupidity, the people in the book demolish their world by way of the atom bomb; only then can civilisation be built again, this time with the right attitude. This sort of nihilistic satire would rear its head only occasionally in Tashlin’s feature films, and never in so extreme a form. Tashlin’s next two features – the domestic comedy Marry Me Again (1953) and the excitingly ribald Susan Slept Here (1954), about a 35-year-old bachelor and the 18-year-old girl who complicates his life – were made for RKO. Commencing the pattern of studio-hopping that Tashlin would follow for the rest of his career, he soon signed a deal with the Hal Wallis unit at Paramount that would have a great impact on his life. Tashlin was now slated to direct the next film pairing of Dean Martin and Jerry Lewis. 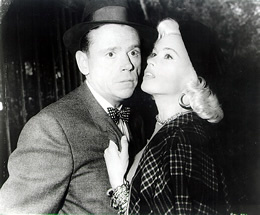 The influential duo was on its last legs: Dean and Jerry were squabbling openly, but managed to eke out three more films together, including the two that Tashlin made with them, Artists and Models (1955) and Hollywood or Bust (1956), which are generally (and correctly) regarded as their two best films. This would be the first of eight collaborations with Jerry Lewis, who had more of an impact of Tashlin’s career than any other single figure. In short, for half of the duration of his collaboration with Tashlin, Lewis was purely a performer. After 1960 the situation became more complicated: there are numerous tales of Lewis wresting directorial control from Tashlin on the set of Cinderfella, to the point where many consider it a co-directed film. 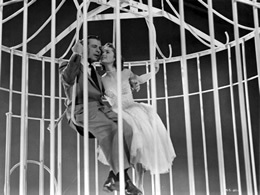 For half of their films together, Tashlin was directing a fellow member of the Directors’ Guild, thereby further complicating the auteur question. Critics made auteurist exceptions for Jerry Lewis and, by so doing, diminished Tashlin’s own creative role in the films on which they collaborated. By the early 1960s, Tashlin was known largely as a director of Jerry Lewis films. When Tashlin’s auteur status was compromised, it carried over to his other work, as well. As a result, Tashlin’s critical reputation suffered, and continues to suffer to this day – his is not a recognisable name to the everyday film enthusiast like those of his fellow auteurs of comedy, Howard Hawks and Billy Wilder, for instance. The problem is more complicated than this, however. 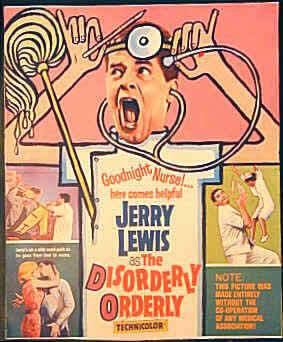 When Jerry Lewis was a popular and bankable motion picture star, and when his reputation among critics was at its zenith – from, approximately, the early 1950s through the mid-1960s – his talent and presence often overshadowed those of Tashlin, the man who, Lewis freely admits, taught him much that he knows about directing (10). But when Lewis’ critical and popular reputation started its lengthy nosedive in the mid-1960s in both America and Europe, Tashlin went down with him. Pockets of unabashed admiration for Jerry Lewis still exist, but, in the mainstream, for the most part, he is either forgotten, reviled, or not taken seriously. As Tashlin’s critical reputation has been tied to Lewis’ for several decades now, the critical devaluation of Lewis offers yet another reason why Tashlin, too, has been largely overlooked. Though Tashlin never spoke in interviews on the subject, it must have been a fairly uncomfortable situation: when Lewis, whose immense international popularity was built partially through Tashlin’s skills, was well-regarded, Tashlin was often relegated to the background; when Lewis’ popularity waned dramatically, Tashlin found himself guilty by association. Most writers on Tashlin would probably identify the mid-1950s as the acme of his career. Both of Tashlin’s Martin and Lewis pictures are well-regarded, as are The Lieutenant Wore Skirts (1956) and the two films which followed it, The Girl Can’t Help It and Will Success Spoil Rock Hunter? (1957). These last two films are usually acknowledged as Tashlin’s greatest achievements. In the figure of Jayne Mansfield, who appears in both films, Tashlin seemed to have found the personification of the vicissitudes of the American 1950s. In a tendency that can be traced throughout his career, Tashlin used Mansfield as both the embodiment of deluxe-padded 1950s glitz, and also as a vivid satire thereof. In these two films in particular, his ambivalence about the modern world is articulated with especial force. The sexual humour that has become something of Tashlin’s trademark is in no short supply in the two Mansfield films; as well, the edge of nihilistic satire that comes through so baldly in The World That Isn’t reappears here, though in somewhat less vicious form. Tashlin’s reputation as an auteur is in many ways staked on The Girl Can’t Help It and Will Success Spoil Rock Hunter? What makes Rock Hunter Tashlin’s best film? The performances of Tony Randall and Jayne Mansfield play no small part here. Randall, simply, has never been better (though The Seven Faces of Dr. Lao  is a special case); one wishes he had been given more leading roles like this one. (Tashlin seems to have had the same wish: he compared directing Randall to playing a Stradivarius. And Randall felt similarly about Tashlin: his conditions for signing on as Hercule Poirot in The Alphabet Murders  were that the film co-star Robert Morley and be directed by Frank Tashlin (11)). And Jayne Mansfield, whose comic gifts have gone unappreciated for too long, gives her signature performance as well. In both of her films with Tashlin, Mansfield precisely locates the thin line between clueless pulchritude and the satirisation thereof. That same thin line between celebration and satire is one of the essential features of Tashlin’s style, and nowhere does it come through more clearly than in Rock Hunter. The title character’s never-ending quest for success – which brings him, as demonstrated in a hilarious montage sequence, international fame as “Lover Doll” – is both celebrated and mocked for the duration of the film: acquiring the Key the to Executive Washroom is tantamount to discovering the Holy Grail. The quest for success is at once so necessary and so ridiculous, as all of the film’s characters eventually discover. This lively satire is still relevant, and still fresh. Probably the most celebrated sequence in the film is that in which Randall steps out of character to address the audience. To accommodate viewers who are used to television, the huge ‘Scope frame shrinks down to tiny TV-size proportions, and goes from vivid colour to scratchy black-and-white. As the picture flickers and flutters, Randall comments on what a remarkable invention television is. Moments later, he adopts a stentorian baritone and is accompanied by melodramatic organ music as he recounts the twists and turns of the plot so far. It should be mentioned that Randall addresses the camera in the pre-credits sequence, as well, during which he also plays all of the instruments in the Twentieth Century Fox theme music orchestra. On one level, of course, this is a Hollywoodian response to the perceived threat of television: how better to take the wind out of its sails than to vividly show its inferiority to film? But it’s also a significant moment of “breaking the frame”, a tactic that Tashlin employed often in his career. Not that it was exclusively his – the films of W.C. Fields and Laurel and Hardy, as well as the landmark anarchic comedy Hellzapoppin’ (H.C. Potter, 1941), break the frame all the time. But it is still a powerful tool of comedy and of satire, and it makes Rock Hunter stand out. Other comedy directors at the time, such as Norman Z. McLeod and Norman Taurog, never tried anything this bold. It would probably be an overstatement to say that the films Tashlin made with Jerry Lewis in 1958 – Rock-a-Bye Baby and The Geisha Boy – marked a turning point in Tashlin’s career, but it would be hard to deny that, tonally, there was something different about them. He seemed to be moving away from Tex Avery’s “Anything for a Laugh” filmmaking philosophy and drifting toward a more maudlin tone in which the comedy often took a back seat to sentimentality. One is tempted to assign the blame for this tendency to the influence of Lewis, whose later films as a director such as The Family Jewels (1965) are not only overly sentimental but also occasionally mawkish. But Tashlin’s next film, Say One for Me, one of the many movies that cast Bing Crosby as a lovable, desexualised priest, is on par with these pictures. With its teeth yanked out by the Production Code Administration, which was especially sensitive when it came to religious matters, Say One for Me is Tashlin’s least funny film, proving, perhaps, that, when deprived of his comedy mainstays of sexual humour and satirical intentions, Tashlin could make films just as uninteresting as any program director. After dabbling in television and writing a few never-produced screenplays in 1959 and 1960, Tashlin directed another Lewis picture, Cinderfella. While this film is more than a little maudlin, their next pairing, It’$ Only Money, is a return to form, and one of their zaniest. The film is ostensibly a satire (of sorts) of film noir detective thrillers, but it’s more than just that. The film has links to vaudeville (in the performance of the wonderful Mae Questel, who also did the voices of both Betty Boop and Olive Oyl) and the wildest traditions of comedian comedy. Lewis is particularly unhinged in It’$ Only Money, more so than he, as a director, would allow himself to be. If there is a “lost” Tashlin film, it may well be Bachelor Flat, which tends more toward pure farce than any other Tashlin film save The Glass-Bottom Boat (1966). Bachelor Flat also demonstrates that Tashlin, even in the later, less generally fruitful, phase of his career, still had a gift for visual comedy. As filmmaker and author Mark Rappaport points out, the aforementioned scene with a small dachshund dragging an immense dinosaur bone along a beach stands out as a particularly clever comical use of the dimensions of the CinemaScope frame (12). This film is also one of Tashlin’s most visually striking, as it makes an especially bold use of colour – a device of mise-en-scène for which Tashlin had great skill. Tashlin continued to shuttle from studio to studio, this time to Columbia to direct Danny Kaye in The Man from the Diners’ Club. Kaye was past his prime as a comic leading man, and this proved to be his last starring role in a feature film. The final two collaborations with Jerry Lewis followed: Who’s Minding the Store? and The Disorderly Orderly. Tashlin directed four more films before retiring from the business, and they are something of a mixed bag. Each of these films has the air of a “one-off” picture: films which Tashlin was brought in to direct more out of circumstance than of interest or desire. Tashlin’s studio-hopping continued until the end of his career: The Alphabet Murders and The Glass Bottom Boat were made for MGM; Caprice (1967) for Fox; and Tashlin’s final picture, the Bob Hope comedy The Private Navy of Sgt. O’Farrell, for United Artists. Tashlin’s final three films have in common the fact that they were all intended as comedic vehicles for stars who had lost much of their lustre. Doris Day was 42 years old in 1966, but still playing a much younger woman. The Glass Bottom Boat is actually a highlight of the late period of Tashlin’s career, with its interesting use of the CinemaScope frame, vibrant colours, and a gentle sense of absurdity. It is also interesting to note that the film features a young Dom DeLuise doing his very best Jerry Lewis impression – and a good one, at that. Perhaps Tashlin was missing his most talented comic collaborator. It is interesting but not necessarily meaningful that Tashlin’s feature career is bookended by collaborations with Bob Hope. Though surely one of Hollywood’s most resilient figures, Hope’s popularity had faded significantly since the time of his first collaboration with Tashlin, The Paleface, twenty years earlier. Hope’s heyday was long over: his most popular films were made in the 1940s; by the late 1960s, he seemed, especially given his famously hawkish stance on the Vietnam War, a relic from another era. The film, like Hope, seems more than a bit out of step with the times; it also suffers from the worst cinematography of any film in Tashlin’s oeuvre. Though he wrote several more screenplays in the next few years, none were produced. Tashlin effectively and contentedly retired from the movie business. During his lifetime, Tashlin’s own films were not taken particularly seriously. A little more than one year after his death in 1972, the first retrospective of his work was assembled at the Edinburgh International Film Festival, an event that occasioned the publication of the first book on Tashlin’s work. Since that time, only one other book-length study of Tashlin has been published, also on the occasion of a retrospective of his films, this time at the 1994 Locarno Film Festival. Since that time, critics have been mostly silent on Tashlin, and good prints and videos of his films are hard to come by. At first glance, Tashlin begs comparison to his auteurist colleagues of Hollywood comedy Billy Wilder and Howard Hawks. He was, after all, on their level as far as success and prolificness. But the comparison gets a little shaky when we consider that many Hollywood auteurs, including Hawks and Wilder, are granted that status in part because of the way their own thematic and stylistic concerns come through no matter the genre in which they work. Tashlin worked only in comedy, suggesting comparisons with studios veterans such as Hal Walker, Norman Taurog, and Norman Z. MacLeod – none of whom are usually afforded auteur status. Tashlin certainly straddles both of these camps, but how can we make a case for his talent and distinction? In my opinion, the answer lies in part with Tashlin’s sense of humour, which is far more consistent than those of Hal Walker, Norman Taurog, Norman MacLeod and their ilk. Tashlin’s targets remain constant: consumerism, sexual mores and the foolishness of the modern way of life. All of these can be traced back as far as his work in print cartoons. Tashlin’s great strength lies in his gift for mise-en-scène; more specifically, in the ways in which he used devices such as color and framing to create comedy. Tashlin’s films are full of jokes in which the humour derives from the very use of a particular device. An excellent example comes from the opening scene of Artists and Models. In this sequence, through comic circumstances too convoluted to relate, several cans of paint fall from a scaffold onto the heads of a policeman and a businessman, the joke is, in part, the very fact of their falling. Messy airborne objects are an old standby, and nearly guarantee a laugh. (Tashlin himself uses the paint-can gag in more than one film.) But the real punchline comes in the vivid colors of the paints: ultra-bright white and brilliant red, made all the more brilliant by Technicolor. The richness of the colors emphasises the drabness of the clothes of the men – and of the men themselves – on whom the paint falls. Here, Tashlin uses a particular element of mise-en-scène for the purpose of bringing into relief an additional level of humour in the gag. The gag is, on one level, the colours themselves. Performance, lest we forget, is another important facet of mise-en-scène. Whereas the more workmanlike directors listed above often worked with top comic talent, they rarely fully incorporated these comedians’ personae into the style of their films. Take a look at an early Martin and Lewis picture like Walker’s At War with the Army (1950), a stagy, plodding mess that takes place on but five or six flimsy sets. Walker plainly has no idea what to do with Lewis, whose natural comedic gifts tend toward the explosive but who is reined in by uninventive framings (nearly every shot is a plan americain) and blocky, confining sets which prohibit him from engaging in the physical comedy for which he is justly famous. When Walker needs a laugh, he puts Martin and Lewis on a stage and has them do a watered-down version of their nightclub act. In other words, the film is not built around the talents of the performers. Granted, At War with the Army is a low-budget film, but Tashlin made low-budget films too. Even a smaller-budget later film like the lacklustre The Alphabet Murders uses unusual compositions to generate laughter: a brilliant variation on the standard shot/reverse-shot comes early in the film, when Tony Randall and Robert Morley converse with each other with a small mirror between them. Tashlin frames the shots so that we see Randall’s face with (a reflection of) Morley’s mouth and chin, and vice versa. The funhouse effect generates comedy from a scene that would otherwise have little, and therein lay Tashlin’s great skill. When working with Jerry Lewis, arguably the most influential and gifted comedian of the second half of the twentieth century, Tashlin tailors his every shot to showcase his star’s prodigious talents. Examples abound, and include the rooftop antenna/firehose set piece from Rock-a-Bye Baby, the vacuum cleaner gag from Who’s Minding the Store? and nearly every moment of It’$ Only Money. Why is Tashlin forgotten? In part because Jerry Lewis is roundly (and wrongly) reviled these days, and Tashlin is inextricably linked to him. Partly, perhaps, the sexual humour is dated, though a recent Tashlin retrospective in Madison, Wisconsin, showed that his naughty jokes still summon belly-laughs. Largely, I think, it’s through some quirk of time and fate that Tashlin is not better-remembered; his films hold up very well, and they’ve influenced everyone from Jerry Lewis himself to Joe Dante (an admitted acolyte) to Jean-Luc Godard (another one). Tashlin is surely due for a re-evaluation. Tashlin’s film career has three distinct segments: the first is comprised of his animated work; the second, of his career as a screenwriter and gagman; the third, as a feature director (though he did do some writing only work even after becoming a director). These are noted in the filmography below. The Bear That Wasn’t (1967) producer; this was an animated adaptation of a children’s book written by Tashlin; it is listed here to maintain chronology. Roger Garcia (ed. ), Frank Tashlin, London, British Film Institute Publishing, 1994. Claire Johnston and Paul Willemen (eds), Frank Tashlin, Colchester, England, Vineyard Press, Ltd, 1973. The Bear That Wasn’t, New York, E.P. Dutton & Co., 1946; reprinted by Dover Publications, Inc., Mineola, NY, 1995. The Possum That Didn’t, New York, Farrar and Strauss, 1950. The World That Isn’t, New York, Simon & Schuster, 1951. How to Create Cartoons, Los Angeles, The SCOTArt Publishing Company, 1952/1953. Modern-day directors Tim Burton, Terry Gilliam and Mike Judge also started in animation before moving to live-action. This and much of the rest of Tashlin’s biographical information comes from “Chronology” by Howard Prouty (Acquisitions Archivist at the Margaret Herrick Film Library of the Academy of Motion Picture Arts and Sciences, in Roger Garcia (ed. ), Frank Tashlin, London, British Film Institute Publishing, 1994, pp. 187–195. Greg Ford, “’Cross-Referred Media’: Frank Tashlin’s Cartoon Work” in Garcia, p. 81. Of course, there is no camera placement or movement per se in animated film, but the director’s decision to draw a scene from a single perspective instead of the many other possible choices is the equivalent of a live-action director deciding where to physically place the camera. Thomas Sugrue, “From Comic Strip to Comic Art”, The Saturday Review of Literature, February 16, 1946, cover and pp. 15–16. This chart does not include Lewis’ cameo appearance in director Stanley Kramer’s film It’s a Mad, Mad, Mad, Mad World, released in 1963, between The Nutty Professor and Who’s Minding the Store? On Jerry Lewis’ adulation for Tashlin, see Peter Bogdanovich, “Mr. Lewis is a Pussycat” in Garcia, pp. 131–133. Interview with the author, July 2003. See Mark Rappaport, “Tashlin, Bachelor Flat and CinemaScope” in Garcia, pp. 71–74. Ethan de Seife completed his dissertation, Cheerful Nihilism: The Films of Frank Tashlin, at the University of Wisconsin-Madison in 2005.